This entry was posted in Uncategorized and tagged Adrian Beck, Authors, Reading by smotlrcblog. Bookmark the permalink. Adrian says it all ‘A huge shout out to Kim Yeomans, the St Martin’s Teacher/Librarian extraordinaire is always devising ways to bring books to life and to make reading fun for her kids.’ Sounds like you are all having too much in your library – is that possible? Probably not. Keep up your great work with great connections. What a great bloke that Adrian is and he certainly knows where to go to have fun. Adrian is definitely a great bloke and an author who loves to connect with his readers and is always thinking of ways to make reading fun! We are VERY lucky at St Martin’s to have developed a great connection with Adrian. Yes, we enjoy having fun at our library because #ReadingIsFun!! I think the blog looks good . Maybe I will read the Stuff Happens books! Pig the Pug is so cute and I will enjoy Pig the Pug if I get him and I will read him books. I`m glad we got more Stuff Happens books, because I like the Stuff Happens books. I like the things that happen to the characters. Your blog is great and when I say great I mean excellent !!! I love your slide shows that you put on the blog !!! The Stuff Happens books are very popular in our library and you should try them Antonia. I like the different things that happen to the characters in the Stuff Happens stories too Riley. It was definitely a huge book cover Lachlan and the Year 4 boys and I had lots of fun helping Adrian to make the front cover for his book! Thank you for subscribing to our LRC Blog, Luke. It was very hard to decide which boys to ask to help Adrian and I tried to pick boys from each class. I could only choose 5 boys! I’ll definitely keep you in mind next time I’m looking for people for an activity. 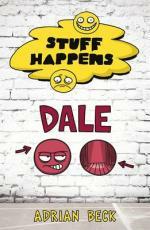 I like the poster of the new book that’s coming out in STUFF HAPPENS Dale. The Year 4s and A.B looked cool and A.B if you’re reading this you looked pretty wierd! 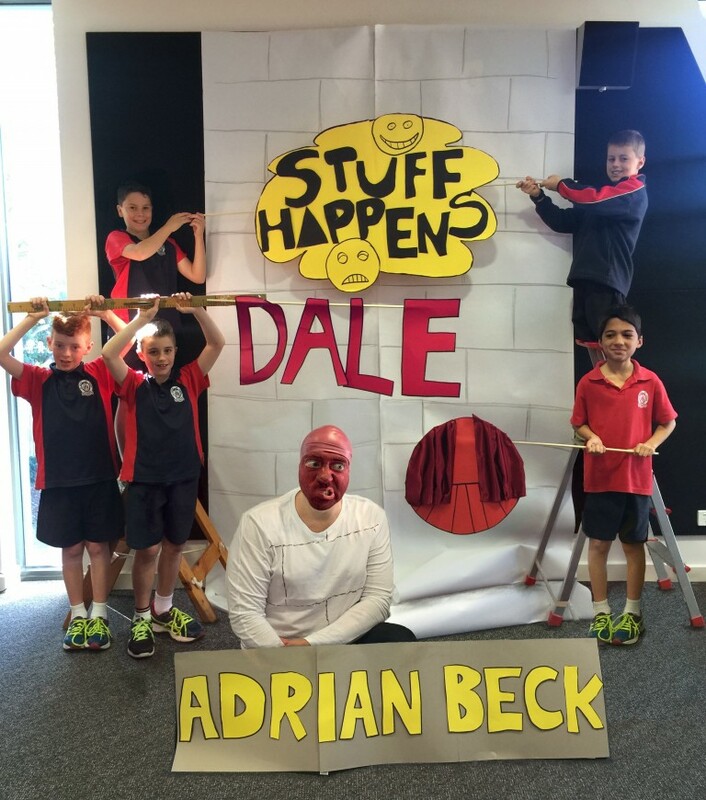 Making the life-sized book cover was a great way for Adrian to let people know about his new book! The Year 4s did a fabulous job and had fun too! It’s not easy to turn yourself into a purple emoji, but I think Adrian’s done a great job! Adrian’s new book will be in our library shortly Aaron. I love reading all your comments on Miss Y’s blog. I’m sure you’ll enjoy the new Stuff Happens stories. And Aaron, I agree, I did look a little weird as a purple emoji, but that was half the fun! That would have been so fun! I can’t believe they got to work with Adrian, I mean you would have to be a little bit jealous. I think Adrian is a really good writer. I think he was really funny. I have a really good idea for you. Here it is, you go to any class you like and do a vote for the best book make sure it’s one you can draw and after that you go back to the library with the class you chose and make the book cover that was voted! I agree that Adrian is a great writer and has a fun sense of humour. Let’s hope he writes lots of books for us to enjoy. I like your idea and have actually been thinking that creating a life-sized book cover could be a fun activity for one of our Book Week Challenge this year…stay tuned!